Do you love the new farmhouse style? Are you renovating a fixer upper, designing a new kitchen or just wanting to update your look? Here are some ideas to breakdown some of the essentials or **wishes and daydreams :)** to get the Farm style look in your kitchen. 1. White or cream cabinets: If you are starting from scratch you should probably go with white or cream or glazed, white or cream cabinets. (But I have dark stained in mine). Choose a traditional design. Now since most people don’t have a new kitchen, consider painting your cabinets. You have to clean them well, and possibly use Kilz primer especially if you have knots in your wood. Otherwise, the Best Behr paint and primer goes on well. So does chalk paint but be sure to use the wax to finish chalk paint or it just attracts dirt. A brush attachment on a drill can help do this big job. See my article on painting furniture for more ideas. This kitchen was designed by Heidi Piron Design and Cabinetry in NJ. Chrome, stainless or brushed bronzed color hardware. This is one of the kitchens by Rafterhouse with a photo by Ace and Whim. Wide casing on windows and doors. Dark or light granite, soapstone, marble, or quartz countertops. This gorgeous kitchen was designed by Heidi Piron Design and Cabinetry in NJ. Farm table -traditional or a newer design. Preferable colors are warm brown antique looking or what is the most popular is a grey finish like worn wood that has no stain. Chairs – Again you can update your kitchen table chairs with the new Brentwood look chairs, metal vintage looking chairs or Paris Bistro style. Or save money and paint your existing chairs in a farmhouse color, whites, blues, greys, creams! Barstools – This may be one of the easier changes. There are new style bar or island countertop height stools or chairs which are out there. Many can be ordered online. 3. Paint colors. Think “Cool”! Whether you have white, cream or dark stained cabinets a lovely grey or blue will update your look and make the cabinets stand out. Also use a white or off white for your trim, doors, and casings. See this article I wrote for more specific choices of “cool” Farmhouse style paint colors. 4. Open shelving – Take down an upper cabinet and replace it with open shelving to display glasses, dishes, baskets, serveware, stoneware, creamware, ironstone or decorations. Use floating wood shelves, or white shelves made from molding. You could also consider taking the doors off of a cabinet and possibly painting the interior another color. 5. 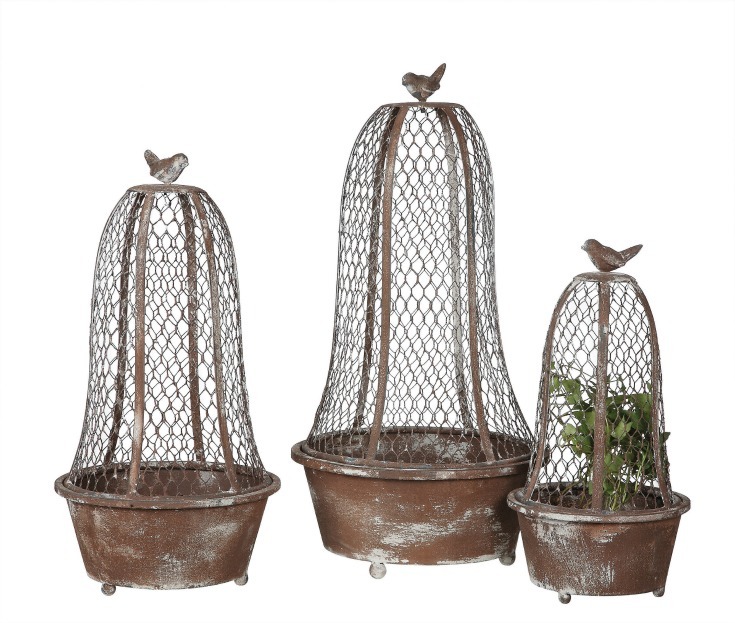 Use Metal Accents – Metal shelving, galvanized aluminum containers, wire baskets, iron mug holders metal lazy susans, metal wall accents and more, add a different dimension to the traditional wood and stand out against white. Their cool feel and dark grey or black colors contribute to the essential look of the new farmhouse style design. 6. RePurpose, ReNew – Think of a new way to use something that you have in the attic or garage. Mason jars to hold utensils, an empty frame hung on the wall with a wreath inside. Old shutters with worn paint – or get new shutters and paint with chalk paint and distress them! 7. Neutral Linens – Whites linen and beige burlap or burlap colored cloth as well as the “grain sack” cloth look are especially important in the Farm style. It’s not like you can’t celebrate St. Patrick’s Day or the Fourth of July but your regular placemats and napkins should be neutral. 8. 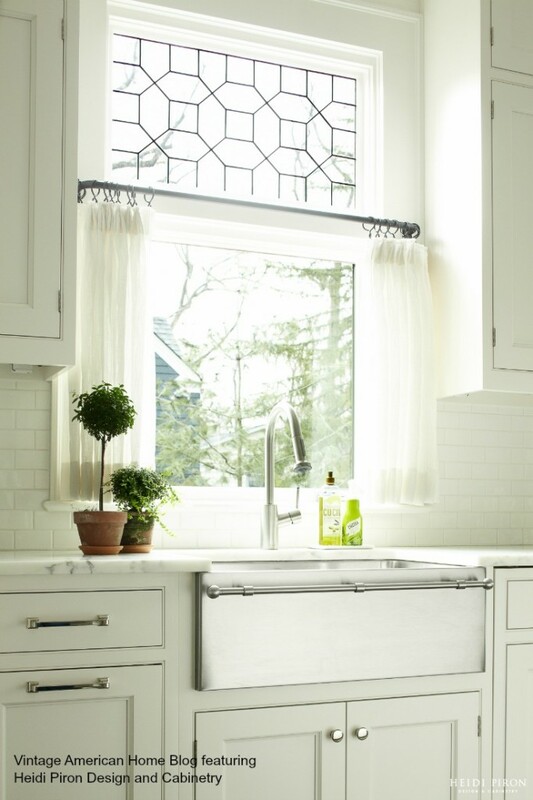 Bare Windows – Leave curtains off of your kitchen windows if you can. If you need privacy use wide width blinds or simple curtains. Most of my windows are bare but I do have wide casings and colonial style mullions on my windows. I used to sew curtains but they are easier to buy now. I do have some simple valance swags in my kitchen and love them so much I can’t bear to get rid of them. I will try to make a post showing how to make them. They are just trapezoids. If you need blinds – here is a good place. If you want to buy curtains go here for some good suggestions. I made these valances but I also like windows with no curtains for the farm style kitchen. 9. Wood accents: Weathered wood or warm brown pieces help continue the feel of “Rustic Farm” and offset the coolness of metal accents. Together they complete the total look. I love the look of hand hewn wood troughs or wooden trays to hold items for a centerpiece. Here is a tray that I have for sale and also a large trough that you can buy from another website. Other ideas are old wood boxes to potted herbs or mason jars with cooking utensils or flatware. 10. White or plain Tableware – I love vintage ironstone and have a collection of pitchers, platters, teapots, creamers and tea cups. Cake pedestals are a special favorite of mine. I like to use them on shelves to lift up other smaller items for vertical interest and height. I try to sell antique and vintage pieces on my website but here are some other places you can get quality reproductions. White plates and serveware go with your cool neutral farmhouse look and look great when displayed against a darker background especially grey or blue. 11. (an extra tip) Lighting: Probably the easiest (if you can change out a fixture yourself) and the most dramatic impact on updating a kitchen is lighting. The new look is a little different than “country” . Wood and metal chandeliers now have a more urban flare. The most dramatic ones have different geometric shames circles, globes, cubes with the candles inside. Also popular are black or grey metal pendants with glass jar like globes that cover the bulbs. Black metal and traditional rustic sconces are still in keeping with the farm look. You can also update your older fixtures yourselves. You can paint anything with black or grey spraypaint. I use Rustoleum. Or you can paint anything even metal with white, cream or blue paint. Fabulous look for any room. More inspiration to get the Farmhouse Style Look in your new or existing Kitchen. The products below are from my store – go to shop menu at the top of this page please. See Farmhouse section. It’s Stephanie Lyons, Theresa Kern’s sister…she sent me your link and I am in LoVE with it all…can’t wait to follow you! Hi Stephanie, Thanks so much! Great to hear from you. I am hoping you can point me in the right direction. I did paint my cabinets off white and I Love them!! I am incorporating many of your ideas in my kitchen…. I made one BIG mistake … When I took my cabinets down I threw away the hinges thinking they are old abd chipped and I was going to replace them with new rubbed bronze ones.., turns out that the ones for my cabinets are not made anymore so I have been searching for hinges for over 1 year and my cabinets have no doors …. I am so sad and stressed after all of the work we did!! Any advice or help getting hinges that fit would be great! HI Dee Anna, That is a shame but I bet if you just used something similar no one will notice and you will get used to it. Oh boy, I guess you would like to import Mrs. Gaines to Flemington? Maybe you can get a designer that is traditional and show them lots of pinterest pictures and they could be flexible and creative enough to get you that look. Good Luck!